The Spotfin Butterflyfish is an elusive fish. I have spent a lot of time during our dives trying to find and photograph these beautiful animals. I saw many more Spotfin Butterflyfish on the reefs near San Salvador than I have seen at other islands ReefNews has visited. This Spotfin Butterflyfish was about 10 inches long. Like other types of Butterflyfishes, the Spotfin Butterflyfish has a tall and narrow body. Notice that it has a long snout, allowing it to reach into cracks and crevices where it catches the worms and other small animals that it eats. The Spotfin Butterflyfish swims by paddling with the pectoral fins on its sides. If you look closely, you will see these clear fins with their diagonal spines on the side of the fish in this picture. Also notice the bright yellow band where the fin connects to its body. 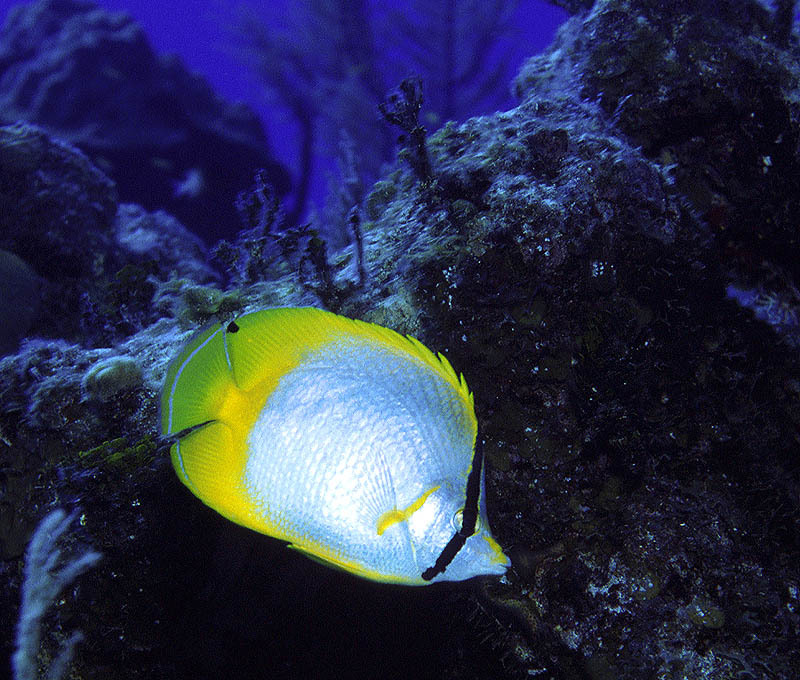 Like many reef hunters, this Spotfin Butterflyfish has a stripe through its eye. In this case, the stripe is a vertical black bar that matches the width of the pupil in the fish's eye. This stripe very effectively conceals where the fish is looking, sort of like a mask. Perhaps this helps it to sneak up on its prey. Butterflyfishes are different from Angelfishes in some ways. Butterflyfishes are smaller, and have longer snouts with smaller mouths. These "tweezer mouths" seem designed to let them reach deep into cracks in the coral reef to find the worms and coral polyps they eat. Their body shapes and swimming styles are similar to Angelfishes, and they eat similar foods. Jonathan Dowell took this picture at a reef called North Pole Cave Reef near San Salvador, The Bahamas in October, 2001. He used a Canon A2 SLR camera with a 28-105mm zoom lens, in an Ikelite housing with an Ikelite Substrobe 200. Copyright © 2002, ReefNews ®, Inc.